Being freelance is magical for me. It’s that “free” part. I was always a square peg in round holes, so being my own boss, working when suits me (often as dawn is breaking), glowing appraisals, and being able to go off-peak to the gym are all huge benefits to working for myself. However, this freedom comes with costs. 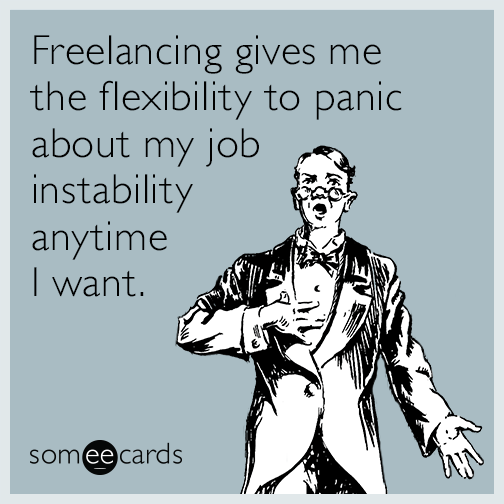 Being freelance means I don’t get sick pay or employer pension, office parties are rubbish, and days off mean not earning. There’s also the feast/famine aspect of freelance work – never really knowing where your next client is coming from, it’s tempting to say yes to everything today in case there’s nothing tomorrow. The Brexit uncertainty means that two of my regular clients have just pressed pause on their work with me. We plan to start up again when things are clearer, and thankfully I have other work to keep me going. All the same, it’s a blow, and not one I saw coming. What if, though, these clients were 100% of my work? Do I have a plan B? And, more importantly, do I have a plan Z? What is a plan Z? It’s an idea that another of my clients uses. What will you do if plan A and plan B don’t come off? If plan A is fulfilling your dreams, and plan B is settling for good-enough, then what is the worst-case scenario? Surely, you need to think positively and not about failure? It’s what you really don’t want – going back to the rat race, bunking on a friend’s sofa, selling your car, etc. You’ll work night and day to stop this happening. Knowing what you will do if it all turns to pants means you can stop worrying. That safety net, however unappealing it may be, makes it (slightly) less scary to take risks. Being clear about your plan Z will help you be realistic about what is a set back, what is a challenge, and what is a sign that you need to stop. Plan Z will stop you eternally flogging a dead horse. There will be some point – some level of debt or income lack – when you are honest with yourself: you gave it a good try, but it is time to throw in the towel. Does anyone ever implement plan Z? Of course! No one wants to get to their worse case scenario, but there is no point having a plan that is unusable. If your plan Z isn’t realistic, it won’t motivate or reassure you. So, no telling yourself that plan Z is sleeping under Vauxhall Bridge and eating pigeons (unless it really is!). Plan Z needs to be unpleasant, but real. Are there alternatives to plan Z? Well, there might be a plan Y. Not quite giving up, but seeing if you can ride it out. Use this time well, it’s not often that successful freelance copywriters have the luxury of spare time. How much money do you need saved to carry you over a couple of dry months? What will be the emotional impact of losing clients? Do you have a support network to cheer you on? Do you have the skills to market yourself? What can you do whilst waiting for new work? get on top of that filing or reading. You have to think about the worst that could happen. If you don’t, how can you make sure you have the survival kit to get through it? Sound advice, thanks for the dose of realism. It’s easy to forget to keep your feet on the ground sometimes. But, actually, I have found it more encouraging to think about the What If? than keep pretending it isn’t possible. Of course it is. Just read this on the Pro Copywriters’ Network, and it came at a very timely moment for me! Now writing out my plan A, plan B, plan Y and plan Z! Thanks so much for sharing. Hope your plan A is thriving! Good luck with your Plan A too – they can be high maintenance!